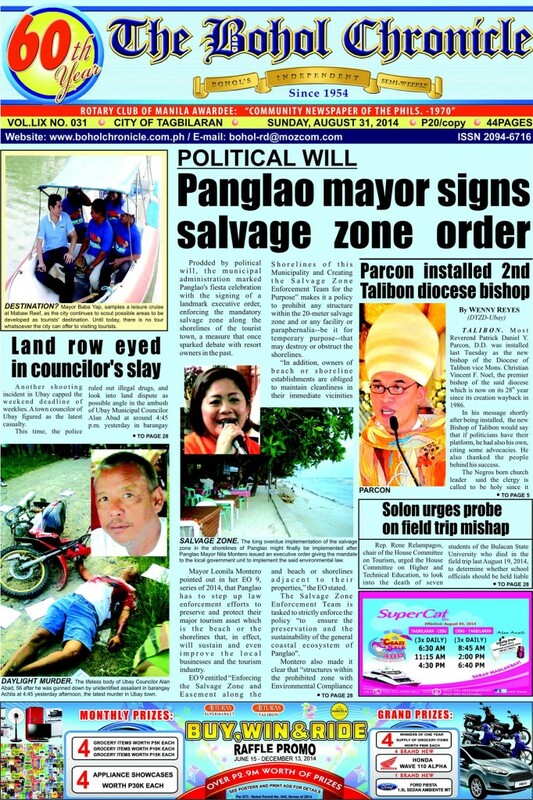 Prodded by political will, the municipal administration marked Panglao’s fiesta celebration with the signing of a landmark executive order, enforcing the mandatory salvage zone along the shorelines of the tourist town, a measure that once sparked debate with resort owners in the past. Mayor Leonila Montero pointed out in her EO 9, series of 2014, that Panglao has to step up law enforcement efforts to preserve and protect their major tourism asset which is the beach or the shorelines that, in effect, will sustain and even improve the local businesses and the tourism industry. EO 9 entitled “Enforcing the Salvage Zone and Easement along the Shorelines of this Municipality and Creating the Salvage Zone Enforcement Team for the Purpose” makes it a policy to prohibit any structure within the 20-meter salvage zone and or any facility or paraphernalia–be it for temporary purpose–that may destroy or obstruct the shorelines. “In addition, owners of beach or shoreline establishments are obliged to maintain cleanliness in their immediate vicinities and beach or shorelines adjacent to their properties,” the EO stated. The Salvage Zone Enforcement Team is tasked to strictly enforce the policy “to ensure the preservation and the sustainability of the general coastal ecosystem of Panglao”. Montero also made it clear that “structures within the prohibited zone with Environmental Compliance Certificate ( ECC ) and which complied with all the legal requirements prior to the issuance of this Order shall be respected, subject however to regulatory monitoring or any actions, that maybe undertaken by the national government”. The mayor signed the EO on August 27 in consonance with Article 51 of Presidential Decree 1067 or the Water Code of the Philippines which provides for the “mandatory establishment of easement for public use along the shores of the seas for recreation, navigation, floatage, fishing and salvage, and prohibits the erection of any structure within three meters from the highest water mark in urban areas, 20 meters in agricultural areas and 40 meters in forest areas. “Nowadays, structures and business facilities are now invading the 20-meter salvage zone territories blatantly violating the Section 51 of [PD 1067]. Some of the structures, aside from defiling the natural scenery, are suspected to have improper septic vaults and sewerage disposal, resulting to seepage of effluents into the seawater contaminating the same with harmful bacteria and hazardous substances,” Montero noted in the EO. The mayor also cited that inadequate setbacks from the waterline brings negative impacts to the natural coastal environment, based on studies. These impacts include aggravated shoreline erosion, increased pollution and siltation, destruction of coral reefs and seagrass beds which are the intangible assets of the local to In implementing the EO, the Department of Environment and Natural Resources (DENR) takes charge of delineating or defining the areas classified under the 20-meter salvage zone or the public easement zone. Coordinates and proper markers shall be installed to be the basis of the enforcement of the law. Based on the EO, “all existing structures within the 20-meter salvage zone as delineated by the DENR shall be removed or demolished which could be done voluntarily by the [concerned property owner] himself, or by the Municipal Engineer’s Office, or by the court”, depending who is called for, in the situation. It is assured, though, that such removal or demolition of the structure must be done in conformity with the law and “must be done with utmost possible diplomacy”. The Office of the Building Official and the Office of the Sanitary Inspector will also inspect the septic vaults of establishments near the shorelines, within one kilometer, to check whether it has complied with the provisions of the Sanitation Code. “If found to be not compliant, the property owner concerned shall be ordered to comply with the standards set within a prescribed period of time. After the prescribed period, follow up inspection shall be done by the above-offices. Non-compliance of the order shall cause the criminal prosecution of the owner of the establishment,” according to Montero. The EO is also intended to enforce the provisions of the Sanitation Code of the Philippines and provisions of local ordinances relating to sanitation, particularly on solid or liquid waste disposal which are considered as the major threats to the coastal ecosystem. “Owners of beach and shoreline establishments are mandated to maintain the cleanliness of their immediate vicinities and beach fronts or shorelines. No throwing of garbage, plastics and any form of wastes are allowed. Scraping of any form of garbage and trash back to the sea water is also strictly prohibited,” according to the EO. The Salvage Zone Enforcement Team created through the EO will regularly patrol the shorelines to check and ensure compliance. The SZET team, under the Mayor’s Office, will also serve as bridge between the municipal government and the owners or operators of shoreline establishments in managing the sanitation upkeep of the areas within their turf. “They are also tasked to diplomatically handle violators in their respective areas of assignments” and shall submit reports on weekly basis or when the need arises, according to the mayor. Also in consonance with Provincial Executive Order 13, series of 2004, the municipality can avail of the services of the Provincial Legal Office, the Provincial Engineer’s Office, and the Provincial Planning and Development Office whichever is appropriate when legal or technical expertise is needed. This will be channeled through a request from the Mayor’s Office to the Governor’s Office.